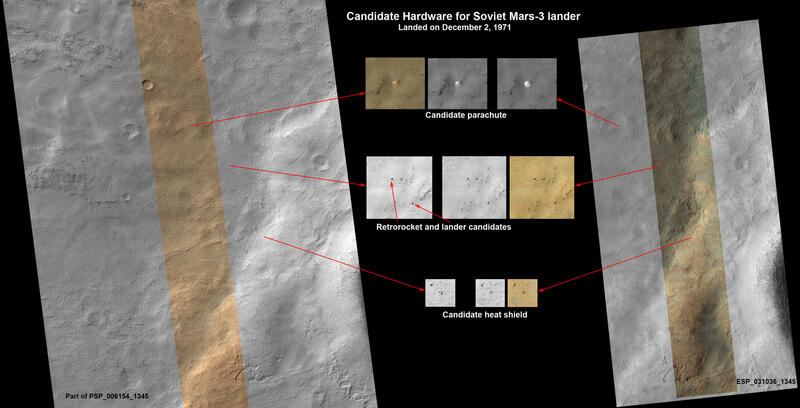 This set of images shows what might be hardware from the Soviet Union's 1971 Mars 3 lander, seen in a pair of images from the High Resolution Imaging Science Experiment (HiRISE) camera on NASA's Mars Reconnaissance Orbiter. The bright feature in this image might be the parachute from a 1971 Soviet Mars lander named Mars 3. The image was taken by the High Resolution Imaging Science Experiment (HiRISE) camera on NASA's Mars Reconnaissance Orbiter. Hardware from a spacecraft that the Soviet Union landed on Mars in 1971 might appear in images from NASA's Mars Reconnaissance Orbiter. While following news about Mars and NASA's Curiosity rover, Russian citizen enthusiasts found four features in a five-year-old image from Mars Reconnaissance Orbiter that resemble four pieces of hardware from the Soviet Mars 3 mission: the parachute, heat shield, terminal retrorocket and lander. A follow-up image by the orbiter from last month shows the same features. The Mars 3 lander transmitted for several seconds after landing on Dec. 2, 1971, the first spacecraft to survive a Mars landing long enough to transmit anything. Images of the possible Mars 3 features, taken by the High Resolution Imaging Science Experiment (HiRISE) camera on Mars Reconnaissance Orbiter, are available at http://uahirise.org/ESP_031036_1345 and http://photojournal.jpl.nasa.gov/catalog/PIA16920 . "Together, this set of features and their layout on the ground provide a remarkable match to what is expected from the Mars 3 landing, but alternative explanations for the features cannot be ruled out," said HiRISE Principal Investigator Alfred McEwen of the University of Arizona, Tucson. "Further analysis of the data and future images to better understand the three-dimensional shapes may help to confirm this interpretation." In 1971, the former Soviet Union launched the Mars 2 and Mars 3 missions to Mars. Each consisted of an orbiter plus a lander. Both orbiter missions succeeded, although the surface of Mars was obscured by a planet-encircling dust storm. 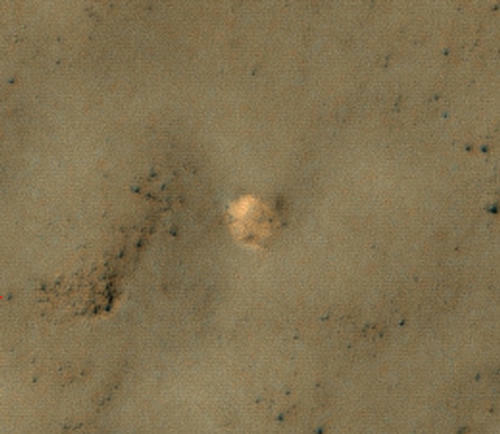 The Mars 2 lander crashed. Mars 3 became the first successful soft landing on the Red Planet, but stopped transmitting after just 14.5 seconds for unknown reasons. The predicted landing site was at latitude 45 degrees south, longitude 202 degrees east, in Ptolemaeus Crater. HiRISE acquired a large image at this location in November 2007. This image contains 1.8 billion pixels of data, so about 2,500 typical computer screens would be needed to view the entire image at full resolution. Promising candidates for the hardware from Mars 3 were found on Dec. 31, 2012. Vitali Egorov from St. Petersburg, Russia, heads the largest Russian Internet community about Curiosity, at http://vk.com/curiosity_live . His subscribers did the preliminary search for Mars 3 via crowdsourcing. Egorov modeled what Mars 3 hardware pieces should look like in a HiRISE image, and the group carefully searched the many small features in this large image, finding what appear to be viable candidates in the southern part of the scene. Each candidate has a size and shape consistent with the expected hardware, and they are arranged on the surface as expected from the entry, descent and landing sequence. "I wanted to attract people's attention to the fact that Mars exploration today is available to practically anyone," Egorov said. "At the same time we were able to connect with the history of our country, which we were reminded of after many years through the images from the Mars Reconnaissance Orbiter." An advisor to the group, Alexander Basilevsky, of Vernadsky Institute of Geochemistry and Analytical Chemistry, Moscow, contacted McEwen suggesting a follow-up image. HiRISE acquired the follow-up on March 10, 2013. This image was targeted to cover some of the hardware candidates in color and to get a second look with different illumination angles. Meanwhile, Basilevsky and Erogov contacted Russian engineers and scientists who worked on Mars 3 for more information. The candidate parachute is the most distinctive feature in the images. It is an especially bright spot for this region, about 8.2 yards (7.5 meters) in diameter. The parachute would have a diameter of 12 yards (11 meters) if fully spread out over the surface, so this is consistent. In the second HiRISE image, the parachute appears to have brightened over much of its surface, probably due to its better illumination over the sloping surface, but it is also possible that the parachute brightened in the intervening years because dust was removed. The descent module, or retrorocket, was attached to the lander container by a chain, and the candidate feature has the right size and even shows a linear extension that could be a chain. Near the candidate descent module is a feature with the right size and shape to be the actual lander, with four open petals. The image of the candidate heat shield matches a shield-shaped object with the right size if partly buried. Philip J. Stooke from the University of West Ontario, Canada, suggested the direction of search and offered helpful advice. Arnold Selivanov (one of the creators of Mars 3) and Vladimir Molodtsov (an engineer at NPO Lavochkin, Moscow) helped with access to data archives. HiRISE is operated by the University of Arizona, Tucson. The instrument was built by Ball Aerospace & Technologies Corp., Boulder, Colo. The Mars Reconnaissance Orbiter Project and Curiosity are managed by NASA's Jet Propulsion Laboratory, Pasadena, Calif., for NASA's Science Mission Directorate, Washington. JPL is a division of the California Institute of Technology in Pasadena. For more information about the Mars Reconnaissance Orbiter, which has been studying Mars from orbit since 2006, visit http://www.nasa.gov/mro and http://mars.jpl.nasa.gov/mro.